I finally organized my cupboard of dishes, which has been jumbled since the move. My inspiration? This 10-cent plastic tray from an estate sale down the street. I like how its lemons and pottery fool the eye when placed among the real dishes. It's okay if you don't have "formal china" or a complete set of dishes. Neither do I.
I've collected all these patterns from yard sales. Blue and white mixes together to feed a crowd with style. Those odd patterned salad plates, when you see them for a dime, are pretty to prop behind the stacks. Your blue and white dishes are so lovely. Your display is quite attractive and really done well. I'm afraid that the mix-n-match gene totally passed me by. I can't do it to save my life, but I love the look of it! You have such a talent for arranging vignettes and displays. Lovely! I'd never have guessed those were dime dishes! You'd do great at arranging things in a thrift store - because they always look better after your touch! 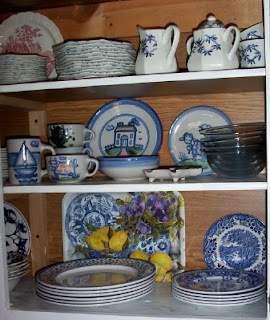 I mix and match blue and white dishes, too. I love the look of it - it's much more interesting than a matched set. And I love the lemons with it. Granny Smith apples look really crisp next to it, too. I've been collecting blue and white transferware for a few years now, and I love the mix and match look too. They are also a nice conversation piece when company comes. 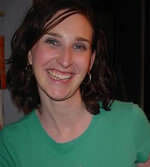 I've been reading your blog for a couple weeks and am enjoying your thrifty tips! Those just look so beautiful. 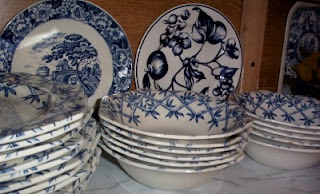 I am just starting my collection of blue & white dishes. My grandmother, a very Southern Belle, has a beautiful collection and she also has that knack for making things look stunning. Those are great!